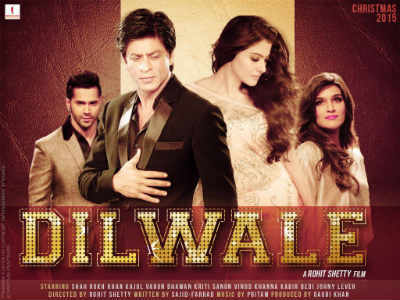 Dilwale to enjoy a Mind-Blowing Opening; may become one of Bollywood's biggest entertainers! The stars predict that the scintiallating magic of SRK-Kajol will leave us enthralled; the movie will do terrific business overall! Ganesha notes that ''Dilwale ” movie will be Launched with Capricorn Ascendant in release time chart. The ascendant lord Saturn will be in the 11th house (gains) of the chart. Mercury , 9th house distance places' lord, will be in its inimical sign with the Sun. Swagruhi Venus (a significator of arts/creations) will be in the 10th house of chart. Mars ,the 11th house lord will be with Rahu in the 9th house. The Moon ,7th house lord, will be in the 2 house of Finance. The movie “Dilwale” may have excellent opening. This movie will win the 'Dils' of people for sure! The performance of the actors will have extraordinary response from the audience. The performance of the leading actors may be cherished, enjoyed and appreciated by the audience. The movie will be performing very well in foreign lands, and the movie may become one of the popular Indian movies abroad. The promotional efforts put in by Team Dilwale will definitely reap rich returns! The film will make producers extremely happy with its fantastic business. Even the distributors are going to have a ball with the performance of this movie! Dilwale will be an out-and-out entertainer and will be thoroughly enjoyable film after a long time and it may even get nominated for awards for various categories. It may set new records for the highest-grossing film in Bollywood. The tremendous pace at which the cash-registers will keep ticking will be just amazing.